The new obsession in our household is apple cider vinegar. 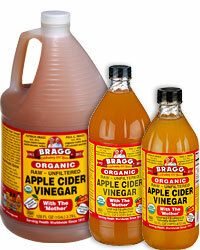 Specifically, it’s Bragg’s Apple Cider Vinegar. After reading so many of the internal and external health benefits, not to mention the chemical-free cleaning uses, apple cider vinegar is now a household staple. Also, we love that there is so much positive commentary about how apple cider vinegar is effective for weight loss. There are many good articles available, and we’re fond of one by MindBodyGreen which explains 15 Reasons to Use Apple Cider Vinegar Every Day. 1. Apple cider vinegar is a completely natural product. It is made from apple juice and is fermented to hard apple cider. It is then fermented a second time to apple cider vinegar. When using natural apple cider vinegar, we instantly decrease the consumption of unnatural chemicals in our homes and daily lives. 2. Apple cider vinegar can be used as a rinse for your hair after shampooing, and will aid in increased body and shine. I recommend recycling an old shampoo bottle, then filling it with 1/2 a tablespoon of apple cider vinegar and a cup of cold water. Pour the solution through your hair after shampooing several times a week for dramatic results. 3. Natural apple cider vinegar regulates the pH of your skin. Dilute apple cider vinegar with two parts water, and spread the concoction over your face with a cotton ball to replace your current toner. You can do this at night after washing, and in the morning before you apply your moisturizer. 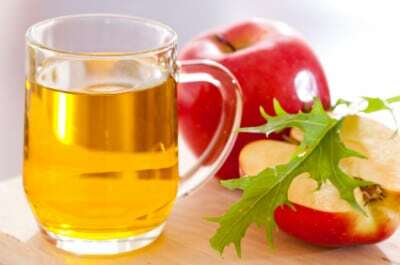 A dab of apple cider vinegar can also be left on the skin overnight to fade age spots or acne scars. Click here to read the full list of why it’s beneficial to use apple cider vinegar each day.